I spent most of the Saturday with Gutenberg and it's Swedish relative, Projekt Runeberg and got so absorbed that I found no time to write about it. The day's find was a Swedish book with pictures and descriptions of craftsmen — yes they were all men. Have you ever felt that you need to learn more about cauliflowers? 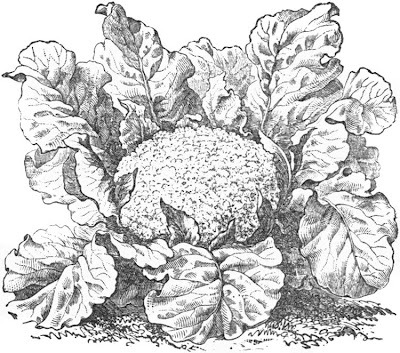 Then this book s for you: The Cauliflower, 1891, by A. A. Crozier. It tells you all there is to know about growing cauliflowers and broccoli. There are even some recipes even if I don't find them too tempting. 23. Á la Louis XIV (Mr. S. J. Soyer).—Cauliflower, new-made butter, grated nutmeg, bouillon. The cauliflower is to be repeatedly washed in lukewarm water, boiled with bouillon and a little nutmeg, drained and then shaken with butter over a fire. To be served as soon as the butter is melted. 28. Cauliflower Omelette.—Take the white part of a boiled cauliflower after it is cold, chop it very small, and mix with it a sufficient quantity of well beaten egg to make a very thick batter; then fry it in fresh butter, in a small pan, and send to the table hot. Note:—This omelette makes a fine dressing to pour hot over fried chicken when ready to send to the table. like to be a soldier? to fight for your country? I don't know when "Young Soldier" by unknown author and illustrator was printed — but I'm sure it is rather old. It only contains eight pictures with a short text to each, and that is more than enough as it glorifies war and soldiers. It was much more fun to read "The Allinson Vegetarian Cookery Book" by Thomas R. Allinson. I have seen it before and even if there aren't many recipes I'd like to try it gives you a glimpse into the past to read this kind of books. Baking powder, soda, and tartaric acid, or soda and hydrochloric acid, or ammonia and hydrochloric acid, or other chemical agents, must never be used for raising bread, as these substances are injurious, and affect the human system for harm. The only ferment that should be used is yeast; of this the French variety is best. If brewer's yeast is used it must be first well washed, otherwise it gives a bitter flavour to the loaf. A small quantity of salt may be used, but not much, otherwise it adds an injurious agent to the bread. This is as sweet and pure a bread as the finger-rolls, and keeps fresh for several days, as it has to be mixed fairly moist. 2 lbs. of Allinson wholemeal, 1-1/2 pints of milk and water; mix these to a thick paste, and put the mixture into some small greased bread tins. Loaves the size of the twopenny loaves will want 1-1/2 hours in a hot oven. I don't think I'll try this unfermented bread — it might keep fresh for some days but I wonder if it is possible to slice it — or chew it! These Sly cakes remind me of what an English friend call sad cakes. 1 lb. Allinson wholemeal flour, 8 oz. butter, 8 oz. currants, 2 oz. sugar, and 6 drops essence of lemon; mix the flour and sugar, and make it into a smooth paste with water, but do not make it very wet. Roll out 3 times, and spread in the butter as for pastry; roll it very thin, and cut into rounds or square cakes. Spread half of them very thickly with currants, press the others very gently on the top, so as to form a sandwich, and bake in a quick oven till a light brown.